This week the China Bear team were called upon to move a god. Or, more precisely, a statue of a god. Weighing somewhere around 500kg, the statue of Buddha was a spur-of-the-moment purchase by its owner while he was travelling through Indonesia. Years before we got near the big fella, Buddha had had a rough life. Somewhere between clearing Customs and landing in the backyard at its first house, the packing crate holding it fell apart, so Buddha’s got a few war wounds. 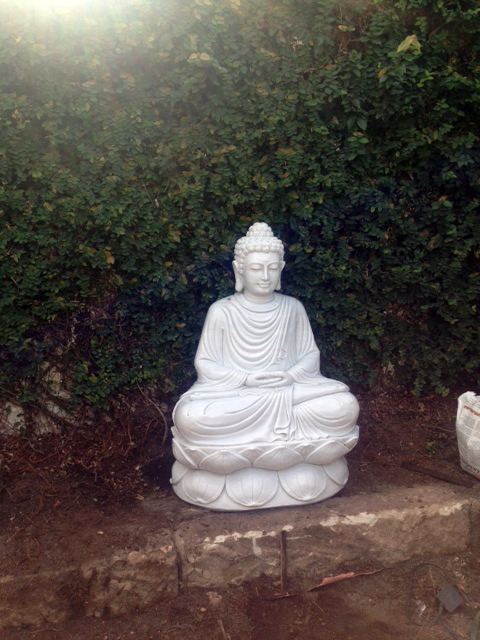 Because the piece is so heavy, when he got it home the client had soaked the concrete it would sit on in oil to position Buddha in a traditional way, which shows a lot of respect. On the other hand, it was apparently used as the Twelfth Man in many a game of backyard cricket! A good spare fieldsman, never complained once…or asked for a go at bat. Anyway, the kids have moved out of home so the parents are relocating to a new house. They couldn’t leave Buddha behind, of course, and that’s where we came in. Moving the thing caused us a bit of grief, because 500kg winds up being a little bit more than you think it is. 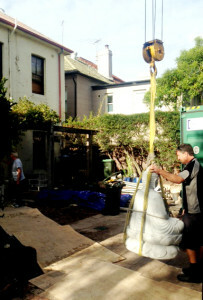 In the end we used a specialist contractor to lift Buddha up over the fence, as well as to position it in the right way at the new place (behind the stumps). Funnily enough, on that particular day, we moved two jade statues, that were 250-odd kilos, for a Chinese guy. It’s not beyond what we do as removalists, but it’s unusual and sometimes does require some specialist equipment and contractors. Just one question: aren’t statues meant to stay put? This entry was posted in China Bear Removals & Storage, Fragile Items, Statues and tagged china bear, fine art transport, moving buddha, removalist sydney, removalists, removals & storage.